My work explores earth's uncharted territories; in my studio I construct landscapes of the ancient past as well as landscapes that may exist in the possible future. I use scientific research to inspire the creation of locations that are absent from human history, recollection and experience. 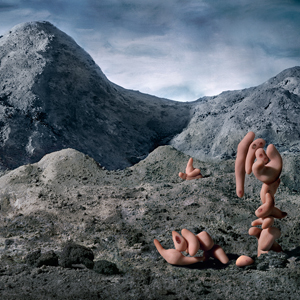 The photographs in INPHA are from the series New Kingdoms, which depicts a future Earth where humans have altered the course of evolution by introducing synthetically grown organisms into the environment. This aftermath of biotechnology takes place in a post human era where man-made life forms have adapted to the natural world. Genetically engineered beings have infiltrated the Earth's surface developing new habitats and ecosystems within the landscape. The sculptures in these dioramas were created to be photographed and are made from a combination of flesh like materials that are inorganic or no longer living. These entities are without medical purpose and are benign in their existence. Contrary to this approach, there is the potential to use tissue engineering for unorthodox purposes. Particularly unsettling is the thought that someday it may be possible to construct autonomous, functioning "beings" that are able to survive outside the controlled facilities of a research laboratory. As the entities in these photographs colonize the terrain, the evolution of these unique species‚ usher our planet into a new biological epoch in the history of life. Through cycles of hybridization, reproduction, mutation, and extinction, survival of the fittest plays out in these scenes.